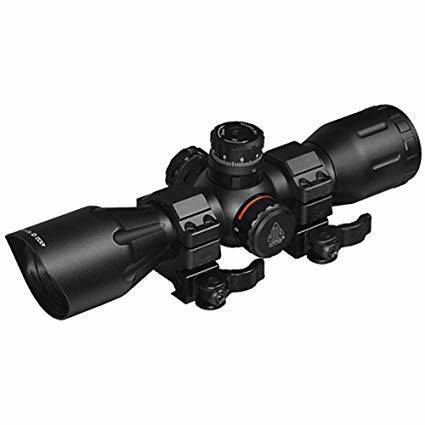 Probably the most notable advantage you’ll be able to benefit from if you decide to go for the Leapers UTG scope is that it provides you with excellent illumination. It boasts a 4x magnification and the clarity and resolution are excellent, especially considering that this optical instrument definitely doesn’t cost a fortune, like many of its competitors. The reticle has all the five lines crossing the diameter of the eyepiece, which can be considered a downside. Based on some of the consumer reports that we have analyzed, it seems that a pyramid style of lines would have been a lot better. Some buyers have received defective units, but if that happens, you can swiftly get in touch with the brand’s customer support and get a replacement. While most of the bow hunters’ opinions we have come across are favorable in this sense, we couldn’t really tell whether the optics of this particular device are multi-coated or fully multi-coated. The brand only states that it uses broadband lens coating. However, based on the excellent user experience when it comes to the light transmission capabilities of the scope, it’s safe to assume that the optics are, indeed, fully multi-coated. Fully multi-coated optical components are the best when it comes to providing you with the brightness you need, especially when you’re doing your hunting in darker environments or at dusk or dawn. The scope comes with a 32mm objective lens that does a great job when it comes to providing you with the light you need to see your targets exactly how you’re supposed to. The view in low-light conditions is excellent, and besides, the illuminated reticle is made with amazing brightness settings. You can set the illumination to be either green or red, and you have as many as 5 brightness settings of each color to select from. Turning the illumination entirely can be done for the black reticle, therefore allowing you to hunt during the day. This scope works with a CR1620 battery, and fortunately, you get one included in the deal. If you plan on doing a lot of low-light hunting, we would advise you to purchase one or even two more such batteries so that you can always use your scope as per your needs. Although the unit offers you the benefits of an excellent battery life, the power consumption can be increased by inclement weather, for example, and a variety of other factors. The UTG 4×32 crossbow scope is nitrogen-purged, which means that you’re going to spend your precious pennies on a unit that’s fogproof, but also shockproof and rainproof. Of course, it’s not entirely waterproof, but it does stand the abuse of rougher environments, so it won’t let you down when you need it the most. Unless you plan to submerge it in water entirely, there’s no chance you’re going to damage this optical instrument too soon. We’ve also come across several reports from hunters who say that they’ve dropped the scope on the floor several times and that it didn’t suffer any damage whatsoever. 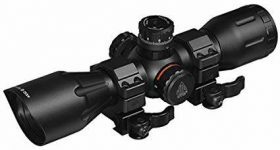 Another great advantage of considering this option is that it comes with its own rings, so you don’t have to worry about anything when it comes to mounting it on your scope. Your crossbow does have to come with a Picatinny or Weaver rail, though, so keep that in mind. Is this scope easy or hard to sight in? It takes just a couple of seconds to get the procedure done as long as you use the zero-reset function to align the markings after zeroing the optical device. It is very difficult, if not impossible for anything to knock off your scope once you’ve sighted it in. This 4x crossbow scope comes with a 32mm objective lens and can offer you excellent clarity and resolution, which is why it is worth trying out. The rings are included in the box, and there’s a 3.8 inch relief that you can benefit from. It’s also nitrogen-purged, so it’s rainproof and fogproof, and once you sight it in, it’s almost impossible for anything to knock it off. The reticle can be considered an inconvenience, though, especially if you’re only used to working with pyramid-style reticles.